Please take a look at the past season highlights 2014, 2013, 2012. Please note: Various media organizations will take photos of Oliver Ames Tigers games during the season. Oliver Ames High School has no relationship with these organizations. The photos are typically copyright protected and cannot be shared. The prices are set by these organizations and they alone earn income from the purchases. If you would like to share your photos please contact info@oafootball.com. Thank you. 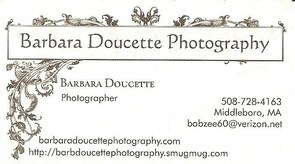 Barbara Doucette is a professional photographer. She works with the football boosters to offer high quality photos of the players and cheerleaders. The photos are used for the program book, senior banners, website etc. High quality prints are also available for purchase from Barbara from her smugmug site. High quality prints are also available for purchase from Barbara's site. Her professional photos are copyright protected and cannot be downloaded. Click on the image of Barbara's business card to access her site. This is not a football fundraiser. Photosfrom 2011 and 2012 football games and other events have been posted on SMUGMUG. This is a photo sharing and storage service that is used by professional and amateur photographers worldwide. The photos provided on the oafootball.smugmug.com were provided by volunteer parents. These photos are not copyright protected. Please feel free to download or share these photos on social networking sites such as facebook or twitter. High quality prints and other products are also available for purchase from SMUGMUG. (Shipping fees apply.) This is not a football fundraiser and no money is earned by anyone other than SMUGMUG. Photos from 2009 and 2010 are available on oatigers.shutterfly.com. Shutterfly is a free photo sharing and storage service which allows you to view pictures and if desired order low cost high quality prints. If you do not have a Shutterfly account you will need to set up a personal account at NO COST to order or download prints. Shutterfly has the option to print the photos locally at CVS or Target. If printed by Shutterfly, shipping charges will apply. The photos on this site were also provided by volunteer photographers. This is not a fundraiser and only Shutterfly earns any income from the prints or the ads on the site.